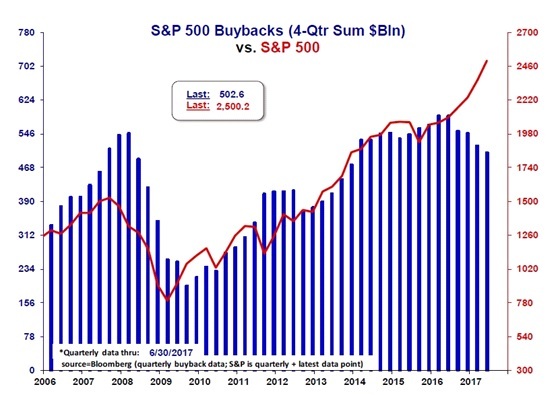 Oct. 3rd, 2017 • ••• A picture worths a thousand words… Imagine 16 pictures… Below, you will understand why a Big Crash is inevitable on stock markets. 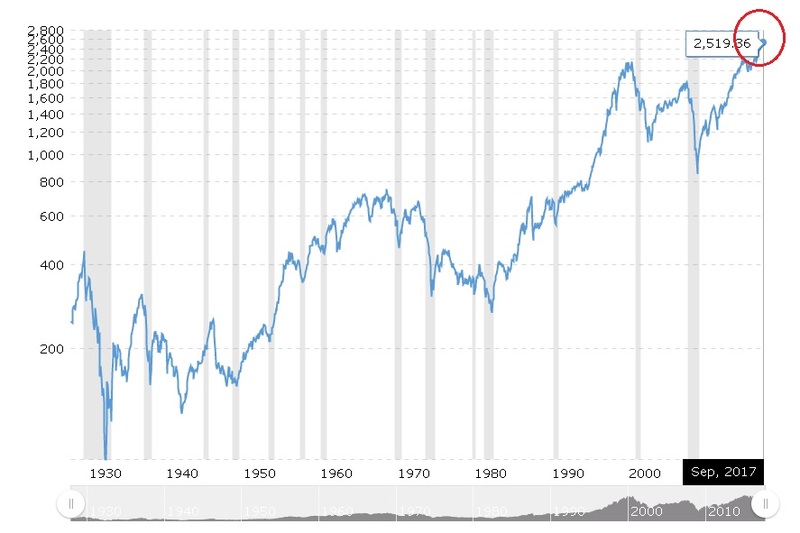 The market (S&P 500) is in all time high. When prices are in all time highs, they can not be cheap; rather, they are expensive. 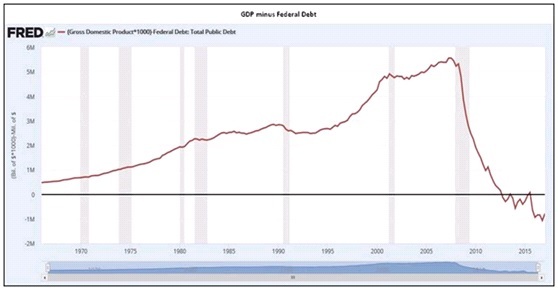 In the graph, you can also see the recessions (shaded areas). If you observe the past, you can understand that it’s about time for a recession to happen. The time that have pass without a recession, seems long. In the chart below, you can see S&P 500 with its trailing 12 month earnings per share. 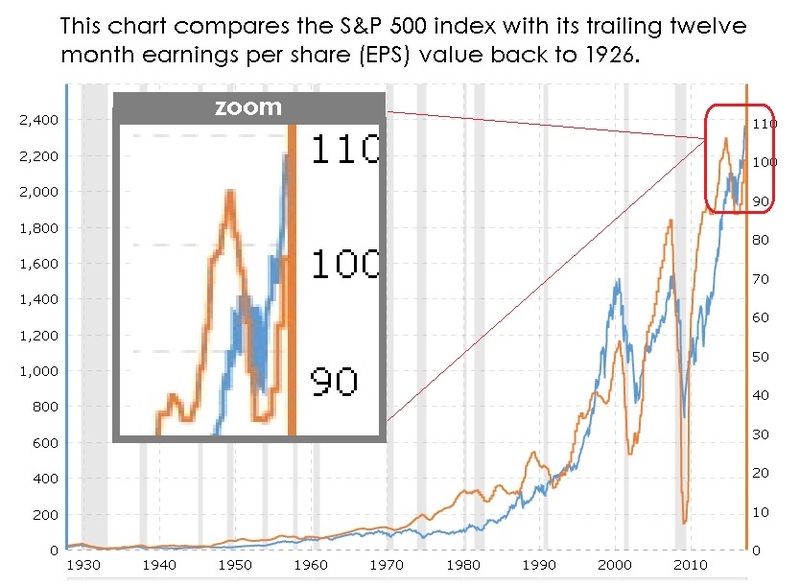 You can observe that when S&P 500 exceeds its EPS line, e.g. 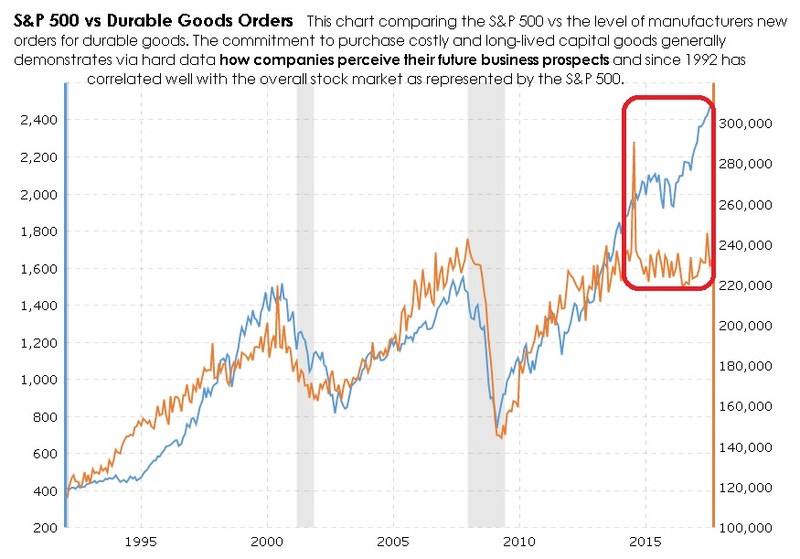 when the blue line is moving above the orange line, prices are expensive, that’s why in the late ’90s that occured again, the market crashed – and now that the late ’90s are history, we know that wasn’t only just little overpriced but was a big bubble. 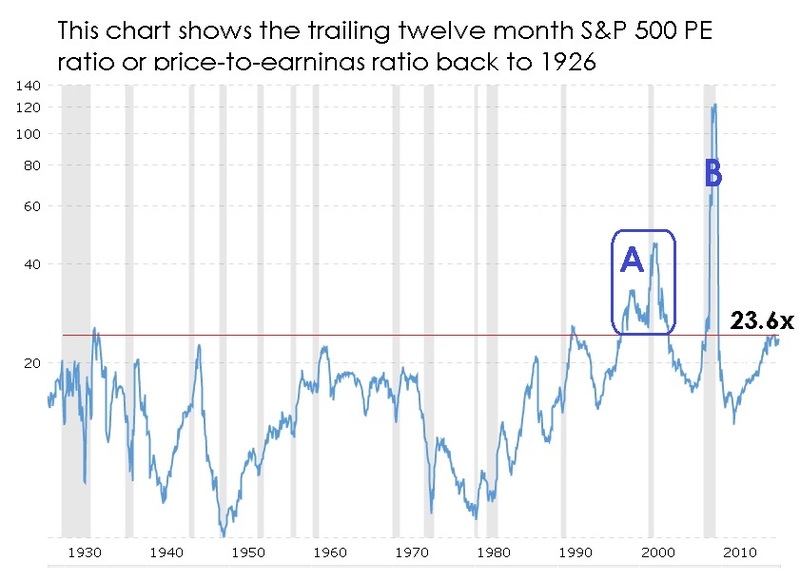 The next graph shows the trailing 12 month P/E for S&P 500 ; you can see that touches vary rare and high levels, that have been seen basically once, at point A. Of course there is also point B, with much higher levels bat those are of 2008, when we experienced the market collapse, so the very big P/Es of this period, are due to earnings collapse of this specific time. It is an extreme phenomenon, under special conditions, that you can ignore. What you must not ignore, is the undoubtelly fundamentally overpriced market today. 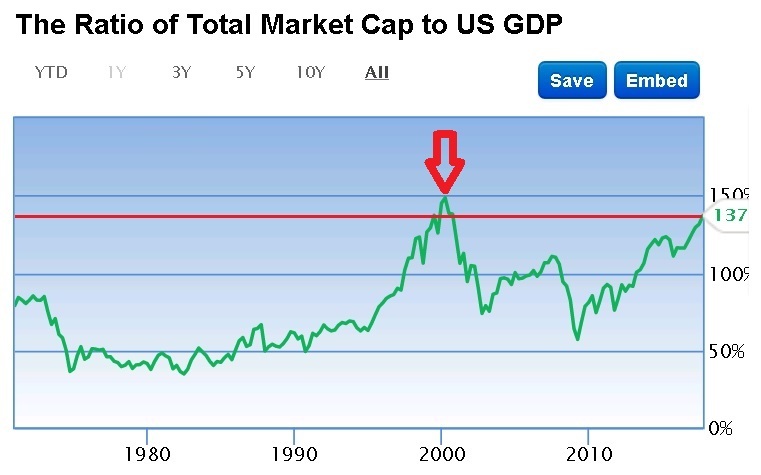 A very ‘clever’ ratio that indicates how the stock market is valuated, is the ratio of total stock market capitalization to US GDP. We can see that today is in very overpriced levels (at 137% of GDP), at levels that only once were larger (re arrow, late ’90s – 2000), but ended with crash. 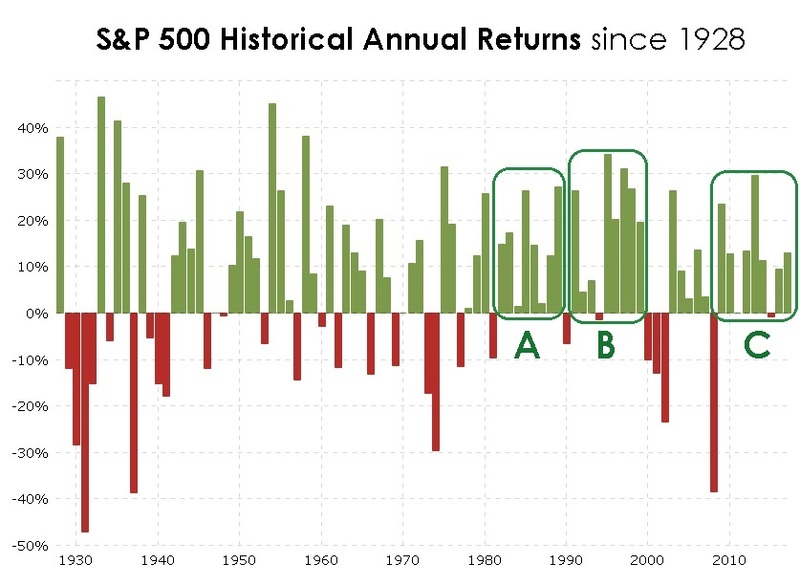 Seeing the history of S&P 500 from the view of annual returns, we can observe that they don’t occur time periods of 10 consecutive years of ‘rise’, without an important correction. For examble, in the period A (1982-1989) we had 8 consecutive years of rise ; in the period B (1991 – 1999) we basically had 9 consecutive years of rise with just one but unimportant annual correction of -1.54% (in 1994) ; and in period C , the current one (2009 – 2017) we basically have 9 consecutive years of rise (2017 included) with just one but unimportant annual correction of -0.7% (in 2015). So its seems abnormal for the market, to keep rising for e.g. other 2 or 3 years, without at least a strong correction. But the big majority of people, think that the market will keep rising. Do you think that in stock markets is the majority that on the long term has correct opinions or the minority. I believe you have heard relative stories: who is profiting from markets? The big majority or a small minority? There is a reason that the Wall Street occasionally speaks for the «smart money». Is Smart Money, the majority or the minority? That’s why there is an old Wall Street saying, «Bulls make money, bears make money, pigs get slaughtered», that warns investors against excessive greed and ignorance of the real situation. 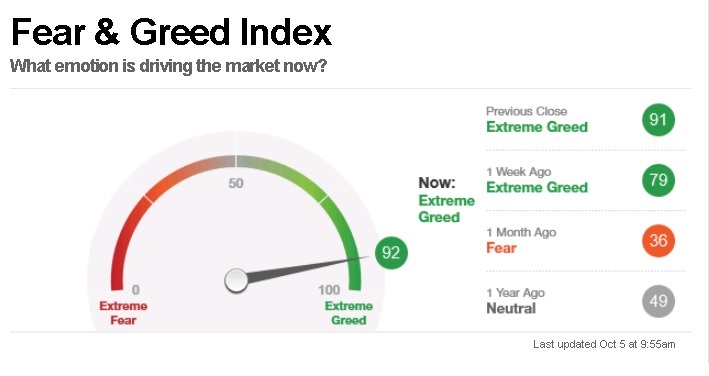 Once again, the greed is (nowadays) in extreme levels. Extreme levels of greed and in the other hand, fear, are strong emotions that prevent you from thinking clearly. And clear mind is a basic parameter, for someone, in order to succeed over the long term, in stock markets. So, can you be a sober investor, with such extreme emotions? 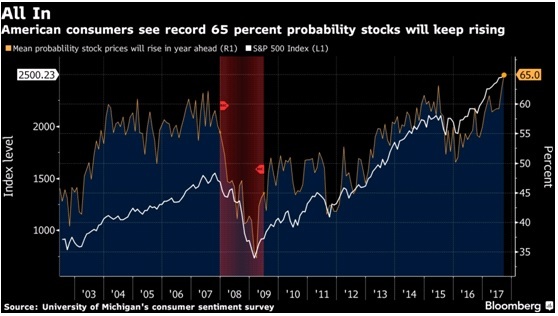 All those that they are so optimistic for the stock market, at least the majority of them, have ‘recently’ discovered (the last years) the passive investing that gains ground against active investing. 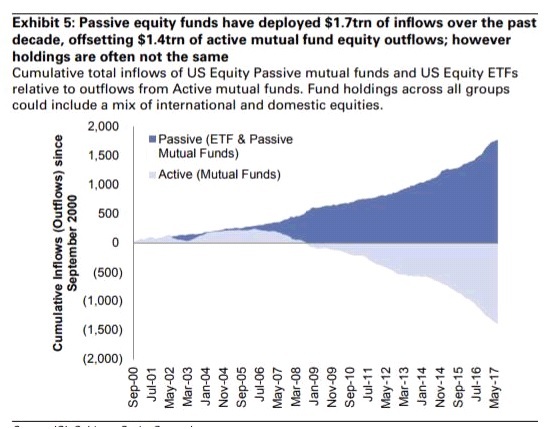 And while, this can be good, however in this particular period that as we concluded with above graphs, stock market is obviously overpriced, it seems that the newbies can not realize this and have ignorance of fear … and reality… So for all of them, passive investing, will proven bad, when the crash will come. The real disposable personal Income (per capita) in percent change YoY, is declining and seems flirting with negative area. Obviosly something like this, is BAD and can lead to a recession of economy that as we saw before, is already late. Because of their bad economic conditions, people stop buying cars. In the last months, the change is negative (< 0). Car sales is a sign of a healthy economy (if sales are rising) and the opposite, if sales are declining, is a sign for a BAD economy, maybe for an economy that flirts with a recession. Real personal consumption expenditures, are also declining ; once again, that’s not a sign of a healthy and growing economy; the opposite, yes. 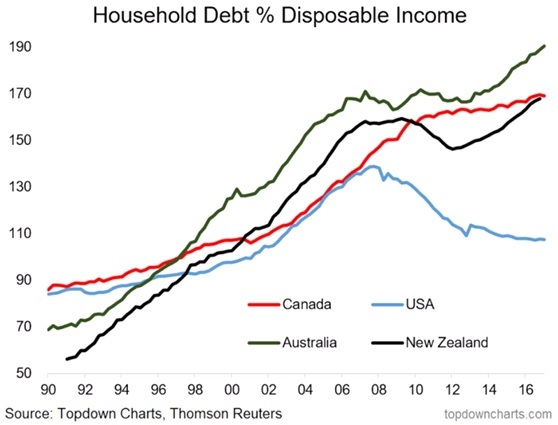 The below graph, present us, the percentage of Household Debt comparable to Disposable Income. And not only in US. We can see that household debt is high, to dangerous levels and mainly rising. Now, You tell me: Is this good or bad for the economy? Having in mind the above, it’s not a surprise the below ‘relation’: Personal interest payments are rising, while personal saving rate, is declining. Don’t you think that the danger for non functional loans is increasing? … consequently, what happens with banks, that they are fundamental to any economy? … and later on, what happens to overall economy? … I remind you that Buffett has about $100 billions in cash. Why? Is he fool? I could add that it is obvious that middle class is been weaken more and more from the income and purchasing power view. How the social security system will be supported in the future? And what about all this huge debt? OK, the interest rates now are near zero but what will happen, when will rise let’s say to 4% or 5%? All the above are facts, you can not ignore. They are not opinions of market newbies that act influenced by ignorance (they heard about new historical highs and they rushed to enter market, in these high levels). … not to mention increased geopolitical risks (Brexit, terrorism, N. Korea etc.). 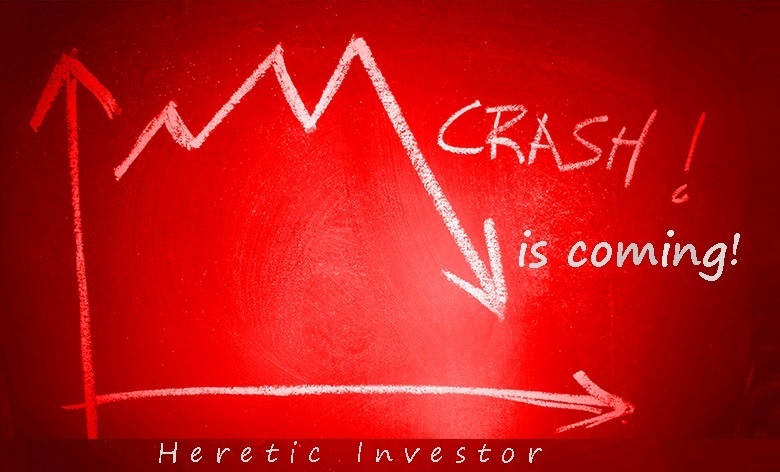 The Crash is coming… sooner or later… if it is sooner can be mild, if it is later can be more crashing crash! Will you be on the side of the Smart Money or on the side of sheeple? • Για τους Έλληνες, μπορείτε εάν θέλετε, να συμμετάσχετε στο σχετικό σεμινάριο που κάνω, μέσω της Ευεπιχειρείν. Θα το βρείτε ΕΔΩ.